Book a collection or call us to set it up for you. Once we have a set date, we will then provide your school with collection bags and an information leaflet to be given out to pupils two weeks before the collection. 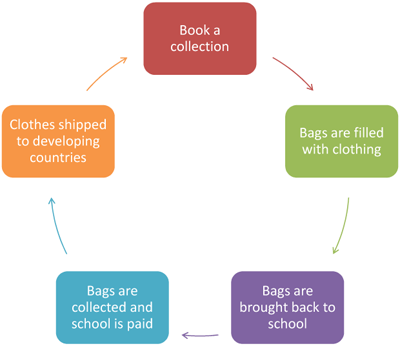 Each pupil is given a bag to fill with good quality adult and children clothing. They can involve the help of mum and dad, brothers and sisters, grandparents, uncles and aunts even friends and neighbours. This is a great opportunity for group participation allowing the child to manage the programme and to feel a personal sense of accomplishment that they have made a difference. The pupils return the recycle 2 school bags to the school on the agreed day when our friendly driver will collect them. The bags are then weighed to determine the value and payment is made within 14 days of the collection. Depending on the participation and quantity collected, your school could raise anything between £500 and £1500. You can also choose to pay the money to a charity of your choice. The more you recycle the more funds you raise. It’s that easy. In addition to raising much needed funds for the school, it will also raise awareness amongst the children about the benefits of recycling.